Arrays are ordered and indexed collections. Other ways in which new arrays can be defined. Much of this is syntactical sugar. Sorting an array with a comparator function of our choice. For this we use the sort_by method offered by enumerable. Let's say, we want to sort an array of integers, in ascending order of f(x) where f(x) = x^2 - x^3 + x + 20. # The last array shows the f(a) values corresponding to each value of our sorted array. Yes, arrSpecialSort was sorted correctly. Selecting specific elements from an array. Suppose we have an array of integers. And we want to select only those which are even. We can use the "select" method over here. Select, transforms a given array into one which only contains the elements which satisfy a certain condition (or predicate). Or you can use select! which modifies the original array and leaves only the odd (or even) elements in it. Applying a function to each element of a list. This can be done using the map method. Suppose, we want a new array, such that, for every element, x in the original array, the new array contains 2x+10. 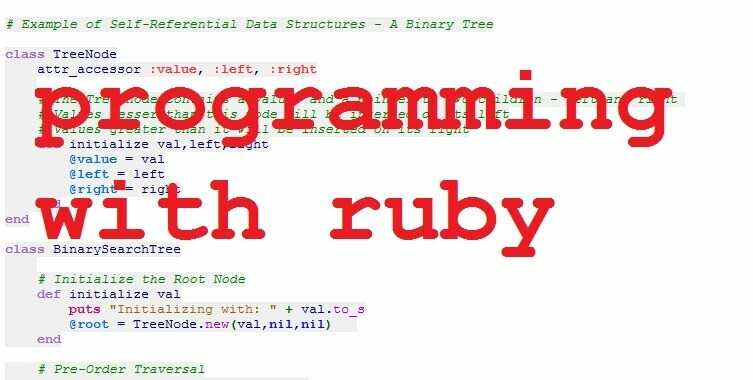 Here's how you could initialize multi-dimensional array in Ruby. The multi-dimensional array, as initialized below, has 10 rows and 5 columns, all initialized to zero. Or you could use 'matrix' which is a package bundled with Ruby.